Model T Ford Forum: Leave your helpful tip here. Leave your helpful tip here. 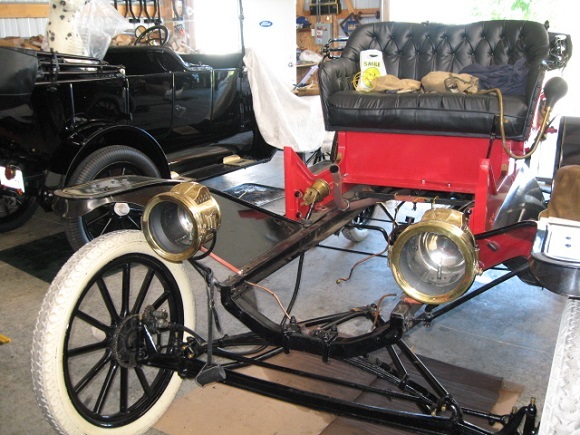 Model T Ford Forum: Forum 2014: Leave your helpful tip here. For the benefit of all of us. Don't use ferrous wire to tie your transmission band ears together for reassembly. There is no such thing as blue food. Keep a couple of old spokes around. They are durable and can transfer power from a hammer into tight spots when needed. Epoxy comes off with enough heat, so does locktite. Having a small pringles can full of kitty litter is useful. Use Whitworth taps on your projects if you hate people. Use a float or trickle charger to keep your battery charged. If you don't drive your T all that much they will help you battery last a lot longer. Bring an umbrella to Hershey. If you have to tighten or loosen a fastener in a tight place or it's dark or you just can't quite identify if it's a Philip's head, slotted head, torx, hex (allen) or whatever; just push your fingertip onto the top of it for a moment and the impression will stay for a few seconds. That's long enough to see what kind of driver you need to bring over to the car from the tool box. You might not see the exact size of a torx or hex but it will put you in the ball park. I've been doing this for years and never gave a thought about it until someone saw me do it and just thought it was the neatest thing. Well,....! I sure wouldn't have thought of it! Great tip! Don't trust your memory in getting mechanical things reassembled correctly. Take lots of pictures BEFORE taking stuff apart. Such drill presses have a step cone pulley on the motor, and an identical cone pulley on the spindle. I just installed another cone pulley in the middle on a spring loaded swing arm for tension, and two short belts instead of the one original long belt. Several more belt combinations for slower speed now, and lots more power,....just right for drilling metal. I found a discarded pair of inline skates on one of my trips to the dump and used a couple of the ball bearings from the skate wheels. They're a pretty good bearing, in fact, they're handy for lots of things. To hold the bearing in the big end of the cone pulley, I just cut out a round disc from a sheet of plexiglass and cemented it in the pulley with JB Weld. When cranking your T, always watch your spark lever. To expand on Darren's tip, right after you shut the T off, set the spark lever fully up and the throttle lever a few notches down in preparation for the next start. That way, even if you forget to look at the levers before the next start, odds are in your favor that they will be in a safe position. Tip#1: When putting a nut on a bolt in a tight spot, like under the starter motor and fire wall area of the frame, wrap tape (any tape) around your finger of choice sticky side up. Stick nut to tape on finger and hold it in place while you screw down with other hand. Tip #2: Put all you got on Blue Bonnet in the third race! Does "Never draw to an inside straight" qualify? If your timer is like mine, it needs to be cleaned fairly often, and if not for the need of two-hands to unbend and remove the tiny cotter-pin in a space where there's only room for one hand, I could sleep through this simple bit of routine maintenance. I've used pointy awls, diagonal-cutters and needle-nosed pliers to straighten out the cotter-pin and one way or another, getting the stupid little thing unbent and out of there takes ten or fifteen minutes. Okay, so I'm a pathetic spazz. -Anyway, the answer to this problem is a simple little hitch-pin clip. -You can pluck it off with a long-nose pliers and put it back on the same way. -Simple. -Is using a cotter-pin really all that difficult? -Nah, but why do it any way other than the easiest? Never test for high voltage with a wet finger. Seriously: Keep a log of what paints, glues, hardware, materials, methods, etc. that are used on a long term project. Trying to remember which black paint was used on a part so it can be matched on a later added part can be frustrating. Just use diagonal cutting pliars and cut the head off the cotter pin. Then pull the bent ends out. When you are ready, replace with a new cotter pin. I like your idea Bob... did the same thing on my T.. works like a charm!!! Use a hacksaw to clean and reshape the slot in screws. If a cotter pin is too hard to remove, back the nut off with the pin in place, it will shear right off, and then you can punch it out without the nut in the way. Set drill bits and taps up in an index so that the proper bit and tap are together, drill a hardwood block in pairs of holes, do this one time and you won't spend time looking every time you need to drill and tap a hole. Norm, great tip, now why didn't I think of that? I have spent way too much time straightening out bent cotter pins so that they can be extracted. No such thing as blue food?? The long, brass cotter-pins that secure the hinges of 2-man tops can snag and rip clothing�not to mention skin�and brother, I'm very, very glad it happened to me before it happened to some car-show spectator who would have had every right to become furious over it. After a little beard-stroking, I came up with the idea of covering the ends of the cotter-pins with flexible rubber tubing (the kind available at hobby shops that sell it as fuel line for model airplane engines). -Leave about 3/8ths of an inch of rubber tubing hanging off the end of the cotter-pins. -It's easier and looks neater than some kind of adhesive tape. Always drive on the left hand side of the road in Australia & New Zealand. When storing coils for the winter put them in a freezer bag with a couple of cup of dry rice and seal. It will stop any corrosion of the points. When its time to use them just pull them out and blow off any rice dust. Cut the head of the rivet off with a cold chisel and use a punch to drive it out. Old school, but less danger messing up with a drill. Those little pins on brake cams- very carefully grind them flat then use a torch to heat the area just enough to discolor the pin or the area around it highlighting the pin. Works on the control rods too. Use key rings instead of cotter pins on things that have to be dis-assembled and re-assembled frequently. When installing heavy parts that use cap screws (bolts) to hold them on, install a couple of headless studs first, the studs will hold the part in place while you install some of the bolts, then remove the headless studs and install the remainder of the cap screws. Just before he died, Grandad said "Never eat blue food". I think he was referring to hams and spaghetti. I didn't read anything more into it. Bob: I do the same thing with "Thread Protectors" from a hardware store. They are sealed on one end and work good. Bob S. - I pulled the cotter pin out enough to cut off the head then pulled out the strips with pliers. Great Tip!!! 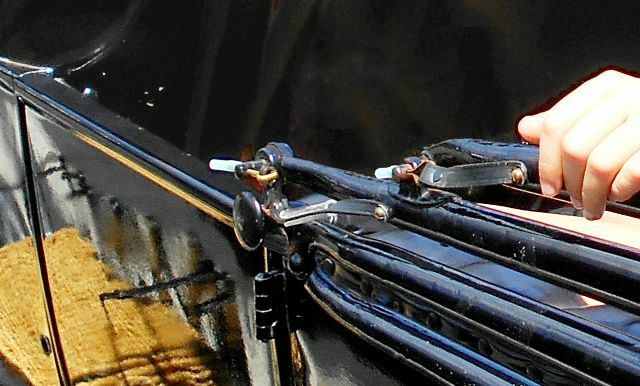 Cut big rubber bands out of old 30 x 3" inner tubes or bicycle inner tubes to secure folded tops bows that rattle. Oh yeah, ... he said "Don't eat inner tubes" too. ESPECIALLY the blue ones ! When pressing axle gears down to remove the keepers, some of them gears are so tight that the axle wants to bow out in the middle. I use a piece of 1-1/2" square tubing w/3/16" wall over the axle to keep it straight. Invest in sweat bands for your forehead on high humidity days...having sweat go in your eyes just before you get that cotter pin in that small hole leads to prolific use of sailor vocabulary. Keep your fingers out of the spokes of moving cars. Never ever get behind an old Volkswagen bus going up a steep hill. I saw that message on a bumper sticker on the rear bumper of an old Volkswagen bus going up a steep hill many years ago. If you park your old T in a small garage like I did when going to college in the early 60's. Which IS the usual way to park one and I had been doing this for a while. But one morning it was cold and my other car wouldn't start so I took the T! Upon hand cranking it it crept forward pinning me to the wall except for the fenders. Thank God the crank was not caught in its chuck or I would have really been injured!!!! You cannot shut off the engine either. Hand break was ON! Doesn't hold all the time I found. I got out by climbing over the front fender but very, very shaken! Concerning the joke about blue food. When I was in College and working in the cafeteria. We had meat that had some mold on it and a bluish tint. The head adults running it had us scrape the mold or blue off of it and were told to cook it real good (hot). I kid you not!!!!! We did throw some of it away. But I had never heard of doing that. I would not do it now (45 years later). Joe, if it has a choke ring up front pull that and it will stop it. Along those lines, in the winter up north if you run 30 weight oil like I do, it helps to jack up one rear wheel to start when cold. Block a front wheel and you won't have to worry about it creeping forward and there will be much less resistance for cranking. I even do it for cold starting in the summer because I often get a free start that way. The donut magnets from speakers are great around the shop. I use one on the drill press to hold the chuck key. They are also great for holding the oil can on the mill or lathe. "Life is too short to use worn out sand paper"
Never eat the yellow snow. For years I have been using a small air hammer with a tool that holds diff screw driver bits. Give the rusted screw some vibration, start working it back and forth and more often than not, the screw will come right out. Used it this morning on the four screws holding the glass clamps on 26-27 roadster windshield. I will be able to reuse all the screws. That slot in the top of the cap on your rattle cans is to hold the small red straw when it is not being used. Use a paint can opener to pull out your Hayet bearings. Be kind to you mother and don't bet on the horses. If your tired of cleaning your timer fairly often or sending your coils out for adjustment, it may bE timer to consider a maintenance free electronic timer.